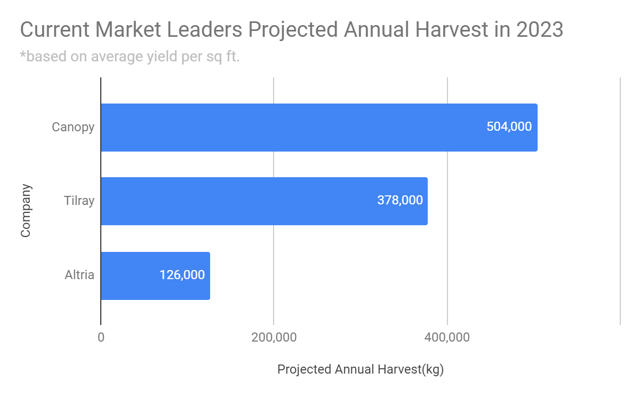 Who Will Be The Largest Cannabis Farmer In 2023? Leading cannabis companies are following traditional methods of producing and collaborating with farmers. Seedo’s cloud based AI algorithm will simplify the process of growing cannabis for small-medium businesses. Aggregating distributed knowledge into Seedo’s cloud technology, while the cultivation algorithm optimizes itself, will position Seedo as the largest and best cannabis farmer. The wave of countries legalizing cannabis for medicinal and recreational purposes has caught the eye of many savvy investors. A race between companies to find the best extraction methods, strands, and highest margin cultivation methodologies has led to a wave of acquisitions and heavy investment in R&D. Companies are increasingly creating distribution partnerships with farmers in order to answer higher demand. The question is; who is on the road to becoming the biggest farmer? The answer might be surprising. To answer this, let’s first define a farmer. I have experience working in agriculture so I asked a couple of my colleagues to define it for me. All of them gave me similar answers. A good farmer is one that experiments, uses data from past harvests, and works according academic research in order to consistently improve their crop. Even more importantly, it’s having a physical presence in the field, notice changes and “understand” your crop. Let’s take a look at the leading cannabis producers and what their growth strategies are. Canopy Growth(NYSE:OTC:CGC) recently reported in it’s Q3 fiscal year results, a 334% increase in product sales as opposed to Q3 last year. This was not only due to Canada’s new cannabis legalization but also due to the fact that the company had a lot of available inventory to sell. The company sold 10,102 kg while it only harvested 7,556 kg in in the same quarter. Last year the company even harvested more (7,961 kg) while selling much less (2,330 kg). The report states that a couple of it’s greenhouse facilities aren’t producing at full capacity. Others are still under construction. In all, Canopy has 4.3 million square feet of production capacity according to the report. Canopy CEO Bruce Linton recently said that they have about 6 million square feet either finished or under construction. The company plans to continue investing in its applied science research team to analyze growth patterns & strands. Canopy has also teamed with other farmers through it’s CraftGrow brand, although I haven’t found any evidence of recent collaboration deals. 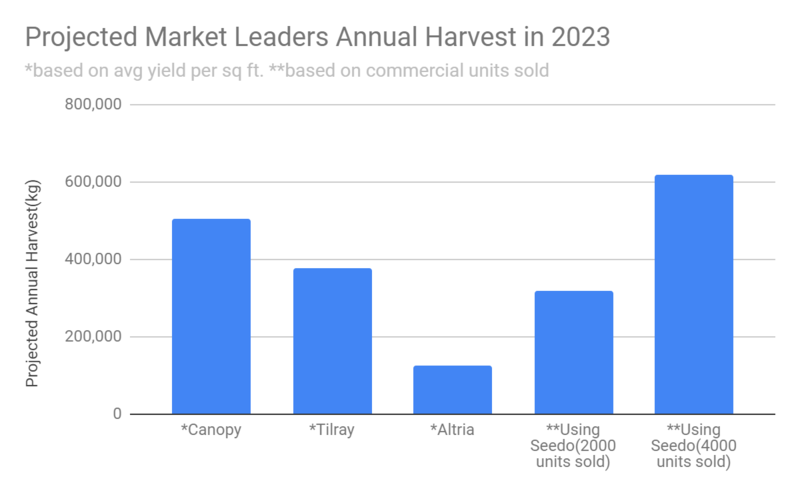 Tilray(NASDAQ:TLRY) announced an agreement to acquire Natura Natural Holdings which will add to their arsenal of production space 662,000 square foot of greenhouse cultivation (only about a quarter currently licensed). The space that they have now can expand and let's assume that it will. In this space they are expecting a harvest of 2500 kg this coming harvest. This is in addition to 3 other facilities in Canada. Tilray also has signed exclusive supply agreements with cannabis licensees throughout Canada. The company also has a cultivation center in Portugal. It is used primarily for supply of the medicinal cannabis market in Europe. The company has assumed a strategy of growing and collaborating with growers to meet demand. Once all of the facilities will be fully active, Tilray will, without a doubt be one of the biggest Cannabis producers. Tobacco industry market leader Altria (NYSE: MO)(think Marlboro), has recently made huge investments to position itself as a cannabis leader as well. The investment in a leading cannabinoid company (NASDAQ:OTC:CRON) as well as in e-vapor company JUUL, are an indicator that Altria is betting on the cannabis industry to steer heavily towards e-vapes. Cronos itself owns companies with different growing methods around the world. The company boasts about owning hundreds of acres that will be used for growing yet the production space that is completed or under construction will have about 1.27 million square feet for production. It looks like they average 84g per square foot. Altria website’s homepage is filled with information about the tobacco reduction steps it is taking. If the company is attacking its main product, it is obviously planning to continue investing elsewhere. Judging by its recent investments, Altria won’t let relative newcomers conquer the whole cannabis market. It will continue expanding its portfolio in the field. These potential market leaders are all taking a traditional approach to a hot new market, all based on a specific crop. They are either teaming up with growers or growing themselves. I’ll give them the benefit of the doubt and assume that they are collecting data about all their growers and using it to grow more efficiently. With their current strategies, none of these companies will likely be the biggest grower in 5 years. All of them have multiple cultivation sites and different farmers in charge. A blueberry farmer told me, “you need someone to walk the fields, look at the plants, feel what they need and understand them in order to grow them better”. A relatively new player in the Cannabis field is Seedo (OTCMKTS: OTCQB:SEDO), is taking a radically different approach gaining competitive advantage using recent advances in technology. Seedo developed a home indoor grow box for cannabis. A completely autonomous one. Inside the grow box are cameras, sensors, and a watering system, making it completely hermetic. The home user connects the unit to a water source, puts a seed inside and through the company app, selects what strand is being used. Each system is connected to Seedo’s cloud and an AI algorithm that sees how the plant is doing, how much water/lighting it needs etc. and acts accordingly. If the plant isn’t growing according to plan, the algorithm corrects itself. The customer needs to do nothing apart from occasionally changing the filters. Seedo sold over $5M in presales and started delivering at the end of 2018 in California. According to their research, each home unit produces 400g of dried flowers a year. At the end of the Q2 of 2019, they are expected to have 3000 systems operational. If the trend continues, they will have at least 50,000 units operational by 2023. That would amount to 20,000 kg a year by their home customers. What’s really intriguing are the Commercial Seedo Container that Seedo is planning on rolling out. These are stackable containers for commercial cannabis growing are autonomous. Entrepreneurs in climate zones where growing cannabis is impossible, can now start their own businesses, while cutting transport costs and legal transport barriers. According to Seedo, each container will be able to produce 150kg a year in a much smaller space than traditional indoor growing facilities. In the case of Seedo, who is the farmer? The fact is, the owner of the system needs to know very little about farming. The real farmer is the machine-learning algorithm of Seedo. The sensors and cameras replace the farmers to detect any problems with the plants and are always there to give it a solution. The constant influx of data from different Seedo growing units, will position Seedo as a powerhouse of knowledge and maybe the biggest cannabis farmer on the planet in 2023. Additional disclosure: Do your own research before investing. This article is for informational purposes only. I wrote this article myself, and it expresses my own opinions. I received a minor cash compensation from a third party that asked me to analyze the question.